Ponto - A plywood replica of a Coquille canoe. Ponto is a 27 ft plywood replica of a Coquille canoe. In Milik, the language of the Coquille Indian Tribe, Coquille is pronounced "ko-kwell". This canoe was named "Ponto" in honor of Tribal elder Frank Younker who passed away recently. 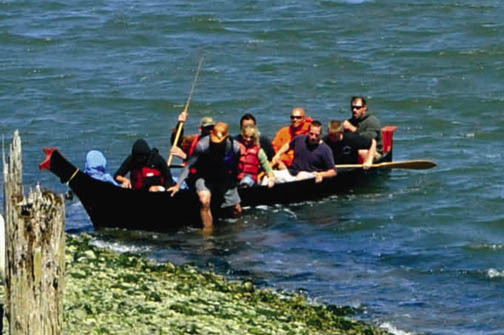 Drag friction on a canoe comes mostly from two sources, skin friction and wave-making resistance. There is a difference of opinion among the old canoe carvers about minimizing wave-making or skin friction. There a many trade-offs in hull design, and this is one of them. The Chinook canoe that I have based some of my other replicas upon was carved to minimize wave making resistance. I decided to make Ponto based on the other style to minimize skin friction. He has turned out to be a fast canoe. However, this does not settle a very old debate. Ponto has been on the annual Paddle Journeys and raced at the Salmon Days at his home port at Coos Bay. These photos show how Ponto is also used to take young people of the tribe to learn traditional ways on the water. Don Ivy, Tom Younker, Dustin Beauvais as well as a number of students from the tribe traveled to our shop a number of times to work on this canoe.